The Woodrow Wilson National Fellowship Foundation has initiated a program to help middle and high school American history teachers incorporate games, play and digital tools into their classrooms. In a partnership with the Institute of Play, the foundation has created the Woodrow Wilson HistoryQuest Fellowship that will allow teachers who are nominated and accepted for fellowships to attend an eight-day intensive summer workshop, followed by a 10-month program of professional development. The foundation's goal is to make classroom social studies and civics instruction more innovative, interactive and accessible to students. "Today's students, second-generation digital natives, have been immersed in interactive technology for much of their lives," said Woodrow Wilson Foundation Executive Vice President and COO Stephanie J. Hull. "Games can make a significant difference in the way they grasp complex topics like history. They give teachers a new way to approach classroom objectives." The fellowships will be offered at no cost to teachers or their districts and the first workshop, planned for teachers in New Jersey, is planned for this summer. 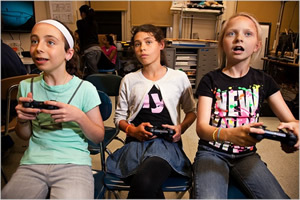 Learn how to design games themselves as part of inquiry-based learning. "This program isn't just about learning how to use and make games," said Institute of Play Professional Development Director Rebecca Rufo-Tepper, "but also about how using games can help teachers to reimagine their practice." Hull added that the HistoryQuest Fellowship is part of the foundation's long-term goal of improving teacher preparation. For more information or to nominate a teacher for a fellowship, go to woodrow.org.